RéserveGroup Blog - Your Tourism Marketing Agency: Facebook launches its own Deals platform! Facebook launches its own Deals platform! Business owners who have Facebook pages can now create and promote special deals to Facebook users, through Facebook Deals - a platform introduced by Facebook to compete with deal websites such as Groupon (or GrabOne and Yazoom, in New Zealand, for example). 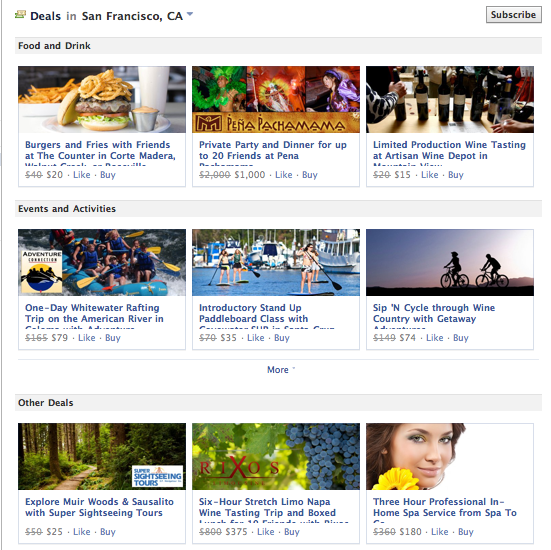 Facebook Deals focuses primarily on offering discounts for group activities. Facebook users will be sent emails promoting the Deals in their area, and there will also be a new Deals link/button on your News Feed panel - for 'one click' access to the specials in your city or region. And if you offer a deal, there will also be a Deals link/button in the left hand navigational column of your Page - so any Fans checking out your Page can easily view your deal. One of the biggest differences with Facebook Deals is - as you would expect - the power and features of social interaction and sharing that are not possible (or are more difficult) with other Deals websites like Groupon. As a Facebook user, I can easily 'LIKE' or send a deal to my friends, so that I can discuss the deal and see who else might like to join me before I commit to buying it. And when I do purchase something (with Credit Card or even Facebook Credits), my purchase appears in my News Feed so my friends can check it out and maybe get it for themselves too. As you would expect - because there is leverage in creating better deals for bigger groups of people - the Facebook Deals so far are mainly for group activities. What do you think? Will you use Facebook Deals when it launches in your city? The ReserveGroup team can help you take your online marketing and social media marketing to the next level - contact us for a no-obligation chat about what we can bring to your business. Thank you for sharing this information. Your information’s very helpful for my business. I have gained more information about your sites. I am also doing business related this. This post is really very nice and informational. I got many new things from it. It’s really very useful. I will definitely be coming back here more often. Thanks a lot for taking your time to share this amazing post with us. thesis writing service At the same time all of the posts on your blog are having informative and valuable content. Once again thanks for putting out such content.